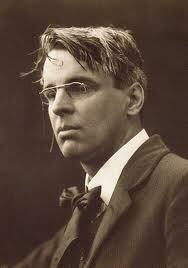 W.B Yeats is one of my very favourite poets. His exquisite word crafting leaves me in awe and in love with his work. I would like to share the eloquence of Social Bridge in placing him centre stage on this, the anniversary of his death. Tomorrow, January 28th, marks the anniversary of the death in 1939 of the great Irish poet and Nobel Laureate, William Butler Yeats. W.B. Yeats’ poetry was a fundamental part of English in school and it was there that I fell in love with The Wild Swans at Coole. I associate the poem very much with my birthday in October, just when we’d be getting settled back into the first term after the long summer holidays. ‘ A terrible beauty is born’ is a line from a poem by one of Ireland’s greatest poets, W.B.Yeats. who died on this day, January 28, in 1939. This line came to mind as I witnessed several bush fires in Western Australia. Bush fires can be catastrophic events, resulting in loss of life or serious injury, devastating loss of property, (46 homes were destroyed in a fire near Perth in 2014) flora and fauna and general disruption by way of evacuations, road closures, power cuts and smoke. Emergency phone Apps beep, the sound of fire engines and police sirens fill the air, helicopters chakk-chakk-chak-chak overhead, planes circle. Here bush fires are fought from the air as well as the ground. In the air, water bombing aircraft and ‘helitacs’ douse the flames, while career and volunteer firefighters and rescue personnel swing into action on the ground, often putting their own lives at risk. Bush fires can move very quickly – often at several kilometers an hour, and are fanned by strong breezes. The tinder dry vegetation is the fuel that makes them catch hold very quickly. This fire was started deliberately by an 8 and 9 year old! The smoke can cause breathing difficulties for those of us with chest conditions, and even if it can’t be seen, the smokey smell can be in the air and even inside the house for days on end. Fires can burn for anything from a few hours to a few weeks. Afterwards there is a huge logistical clean up operation, that may include replacing hundreds of burned poles, washing power lines as can be seen here, searching for injured wildlife, etc. The ‘bush’ is stripped of all low growing vegetation, with only some eucalyptus and grass trees still standing. These particular species can withstand fires and will regrow, but the swathes of beautiful flowering trees and shrubs are gone. Gone too is the wildlife – snakes, birds, kangaroos, wallabies, – their rich habitat lying naked and destroyed. Although denuded and apparently dead, Australia’s bush will rejuvenate itself very quickly after fire, and it will be interesting to see how long this particular devastated area takes to regrow and return to its natural state. However long it takes, a terrible beauty will be born, with wondrous plants,flowers and wildlife. How fortunate we are here in Ireland not to have to deal with these emergencies, although on a day like today with snow and sleet warnings, some heat would be very welcome! Harbingers of Spring Snowdrops in the snow. At this time of year a very common greeting in rural parts of Ireland is ‘There’s a grand stretch in the evenings, thank God‘. Not that winter is over by any means as February and March can be wicked months weather-wise, with snow, ice, fierce winds and rain. We are still perished with the cold and fires still blaze in hearths,but the nights are getting shorter and we are enjoying about 8 hours 45 minutes of daylight, with an extra three minutes or so added each day between now and June. Lambs are being born, snowdrops are pushing up through the snow. Hardly surprising then that our Celtic forebears marked this time as the beginning of Spring with one of their great fire festivals, Imbolg or Imbolc – the others being Samhain, marking the beginning of the year in Winter, Beltane or Bealtaine marking the arrival of Summer and Lughnasa the great festival to herald Autumn. Imbolg, like the other Celtic fire festivals, marks a ‘cross quarter day’, meaning that it falls half way between an Equinox and a Solstice, so Imbolg occurs mid way between the Midwinter Solstice in December and the Spring Equinox in March. The precise date of each of these events varies by a few days from year to year. Not a lot is known about Imbolg, but it may well be derived from ‘i mbolg’ which means ‘in the belly’ as Imbolg is associated with lactation in ewes, which happens in the lambing season. These cross quarter days are celebrated in many forms in different countries. Christians have superimposed religious feasts on these ancient festival dates, so in Ireland we have St Brigid’s Day on February 1st and Candlemas or the Feast of the Purification and Presentation on February 2nd. In the USA there is no such religious imposition as February 2nd is celebrated as Groundhog Day! St Brigid’s Day is marked in Ireland by weaving of St Brigid’s Crosses from rushes and these are then kept in houses for protection until the following year. This is a lovely simple tradition that has been passed down through generations of school children and families. It hardly matters that St Brigid may be more than likely a Christianized reincarnation of a Celtic Goddess, which may well be one of the reasons why we adopted a foreigner (St Patrick) as our national saint, unless of course there was misogyny at play way back when these things were decreed! Pilgrimage in Medieval Ireland has an excellent post on The modern pilgrimages at Faughert on the feast day of St Brigit. Whichever version of this time of the turning of the seasons appeals to you, may you have a Happy Imbolg, a Happy Ground Hog Day or Happy St Brigid’s Day, wherever you are! Water from the Serpentine Reservoir is released into the Serpentine Pipehead catchment some 5 kilometers downstream.The Pipehead Dam is 15 metres high and 142 metres across. From here, the water is piped away to the water mains. The area is heavily forested , most commonly by Eucalyptus marginata that has the Aboriginal name of Jarrah, a dark wood that resembles Mahogany. There are wonderful amenities in the very scenic park ranging from picnic sites complete with gas barbecues, cycle trails, bushwalks, campsites. and there is a very nice café at the top of the dam, with the original name of the Cafe on the Dam! The area is beloved of birdwatchers and just from my table, I snapped these! Just 40 kilometers from the hustle and bustle of the city, Serpentine National Park is well worth a visit! Here in Ireland we are fortunate to have some pretty spectacular and dramatic skies as the sun sets. Living in the country as I do, I enjoy big skies and all the drama they bring. Every cloud does have a silver lining, adding to the spectacle if a few (and not too many!) around at sunset. On a recent trip to the Australian countryside, visiting my family who have become part of the Irish diaspora, I saw this beautiful sunset, just as a bank of cloud was moving in from the north-west. This particular sun was setting over the Indian Ocean, about 12 kilometres away, which probably added to the colours. So for my first post of 2015, I am delighted to share these images, and with them come good wishes to all my readers for a happy and contented 2015. Thank you for your support which is very much appreciated!